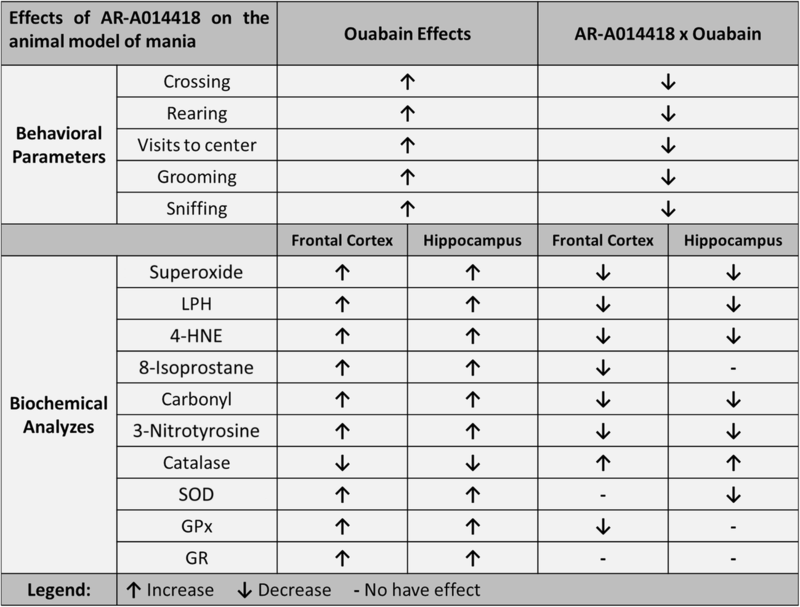 The present study evaluated the effects of AR-A014418 on behavioral and oxidative stress parameters of rats submitted to the animal model of mania induced by ouabain (OUA). Wistar rats were submitted to stereotaxic surgery and received a single intracerebroventricular (ICV) injection of artificial cerebrospinal fluid (aCSF), OUA, or AR-A014418. After 7 days, the animals were submitted to open-field test. After behavioral analysis, the brains were dissected in frontal cortex and hippocampus to the evaluation of oxidative stress. The OUA induced manic-like behavior in rats, which was reversed by AR-A014418 treatment. The ICV administration of OUA increases the levels of superoxide in submitochondrial particles, lipid hydroperoxide (LPH), 4-hydroxynonenal (4-HNE), 8-isoprostane, protein carbonyl, 3-nitrotyrosine, and activity of superoxide dismutase (SOD), glutathione peroxidase (GPx), and glutathione reductase (GR) in both structures evaluated. In general, the treatment with AR-A014418 reversed these effects of OUA on the submitochondrial particles, LPH, 4-HNE, 8-isoprostane, protein carbonyl, 3-nitrotyrosine levels, and SOD activity. 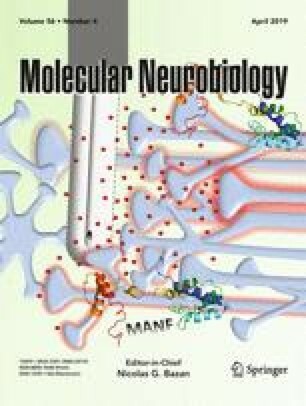 Furthermore, the injection of OUA decreased the catalase activity, and AR-A014418 promoted an increase in activity of this enzyme in the brain structures. These results suggest that GSK-3β inhibition can modulate manic-like behaviors. Also, it can be suggested that inhibition of GSK-3β can be effective against oxidative stress. However, more studies are needed to better elucidate these mechanisms. The effects of AR-A014418 on the behavioral and oxidative stress parameters in the animal model of mania induced by ouabain. Superoxide = superoxide production in submitochondrial particles; LPH = lipid hydroperoxide; 4-HNE = 4-hydroxynonenal; SOD = superoxide dismutase; GPx = glutathione peroxidase; GR = glutathione reductase. This research was supported by grants from CAPES, CNPq, FAPESC, Instituto Cérebro e Mente, and UNESC. SSV and JQ are CNPq Research Fellows. GCDP and SM are holders of a FAPESC studentship and RBV is a holder of a CAPES studentship. This research has no conflict of interest.